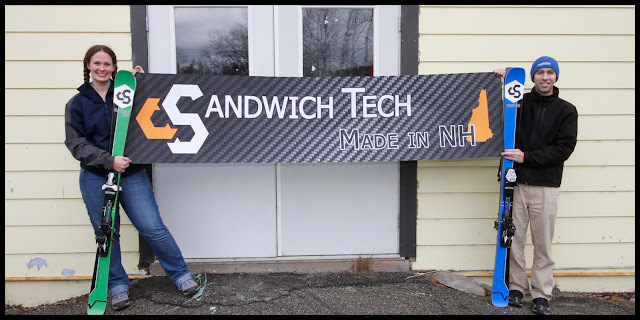 Lancaster, NH: Sandwich Tech, with the help of NCIC, has moved to a larger facility. The new, 4400 sq.ft. space will allow for a significant increase in production capacity. NCIC's article, "Growing Innovators Expand Business", discusses the process Sandwich Tech went through in finding and financing the new facility as well as some of the challenges it brings. 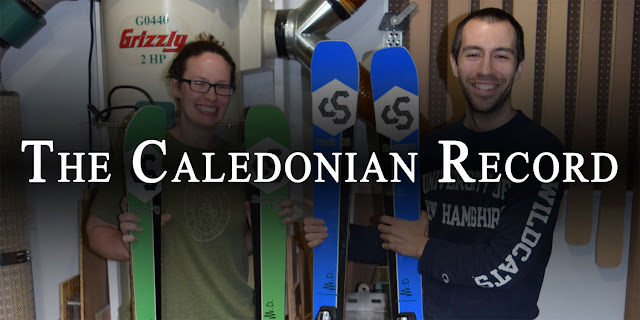 Littleton, NH: Sandwich Tech was featured in The Caledonian Record, the first in a year long series following the growth of this company. The article, entitled "Couple Successfully Blending Business and Pleasure", discusses Sandwich Tech's conception and experience in the Littleton AdVenture Challenge. The article (here) was written by Leah Carey. Part 2 of this series is currently available in Monday's (8/3) Caledonian Record. Littleton, NH: Sandwich Tech featured on WMUR's NH Chronicle. The segment looks at the unique construction of Sandwich Tech's East-Coast carving skis as well as some of the challenges small ski companies face. Local racer and rep, Chris Seely, rips it up at the newly-opened Mt. Eustis. 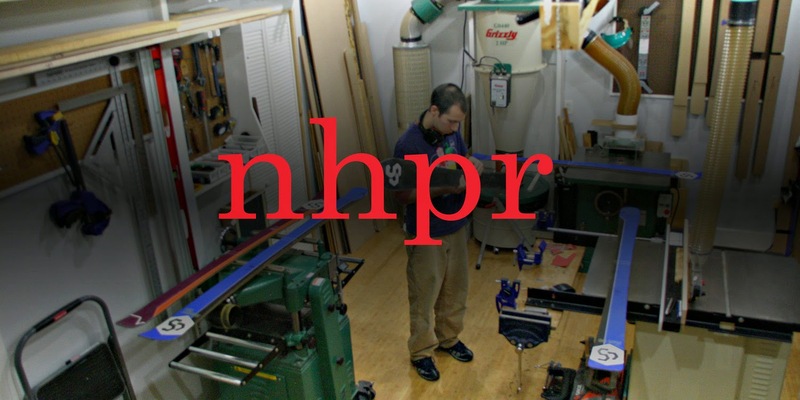 Littleton, NH: Sandwich Tech featured on New Hampshire Public Radio (NHPR). The segment, entitled "Littleton Duo Plows into Boutique Ski Business with Engineering Know-How", focuses on Sandwich Tech's engineering-based design process and their East-Coast carving skis. Engineers Katie Mros and Matt Michaud also discussed their approach to ski design; including the use of carbon fiber and ballistic fiberglass materials. When you lean a ski on edge, its sidecut creates a nice arc in the snow allowing you to make great carved turns. Most skiers that pay attention to what their skis are doing realize this. What you may not have considered is the different types of flex that are at work when you do this. In a ski shop you have probably taken a ski from the rack, supported the shovel with one hand, and pushed on the binding area with your other hand to get a feel for the flex of the ski. This is called a 3-point bend test and it flexes the ski longitudinally (down the length). We will call this flex “bending.” Now, if you were to grip the ski at the binding toe piece and twist the tip of the ski you would get a feel for a different flex. This flex is called “torsion.” Typically a stiff ski is stiff in both torsion and bending, but this does not have to be true. A great demonstration of this is in our video comparison of Volkl’s Extended Double Grip and Sandwich Tech’s Carbon Box torsion technology. In ski construction the torsional stiffness comes from 2 layers of angled fibers and bending stiffness comes from a third layer of fibers. 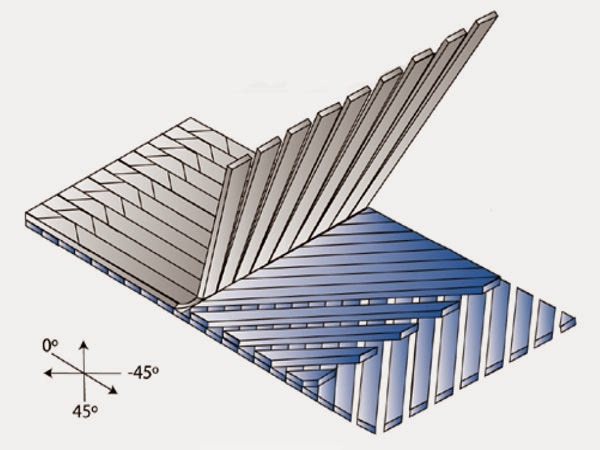 The industry standard for these three composite layers is to use triaxial fiberglass which comes pre-knitted together for convenience (see picture). While this knitted fabric is a good combination for many designs, it can be improved upon. Splitting up the layers allows each one to be optimized independently. We have found our Carbon Box and Ballistic Glass to complement each other for high torsional stiffness and resilient bending, respectively. Now, if you have made it this far you are probably wondering how bending and torsion effect a great, corduroy-trenching, carved turn. In hardpack, an on-edge ski is initially only supported by two points along one edge of the ski – the contact points at the tip and tail. Because your weight and centripetal force are pushing on the ski, the rest of the ski’s edge is being flexed toward the ground. The ski is going to flex in both bending and torsion until the edge reaches the ground, creating an arc in the snow. If your ski only flexed in bending, then the metal edge would dig into the snow at the same angle down the whole ski. However, because your ski also flexes torsionally, your tips engage at a lower angle than underfoot. This is why a torsionally soft ski reduces your edge grip. When you look at bending and torsional flex separately, it is easy to see why increasing torsional stiffness without increasing bending stiffness is highly sought after by ski designers. Bending compliance offers variety in turn shapes and easy turn initiation. At the same time torsional stiffness dramatically improves edge hold and high speed stability.